When he was 12, William Palmer joined a gang without even realizing it. To him, he was just hanging out with his big brother and their friends in their Easterhouse neighborhood in Glasgow. At first, he stood and watched as his friends defended their 200-sq-m territory from rivals. Lining up military-style, both sides would lunge and retreat until someone, usually drunk, engaged, and the fight would begin. Soon enough, Palmer was fighting alongside his brethren. By the time he was 20, he was selling drugs  mostly ecstasy  to younger kids in his neighborhood, taking care to avoid other gangs' territories lest he get jumped. Now 29, Palmer regards himself as lucky to have survived his youth. One of his brothers, a heroin addict, is in prison. Palmer himself did a two-year term after attacking a rival gang member with a hatchet. That led to an epiphany, and he joined Alcoholics Anonymous to dry out. Today he mentors kids at risk of joining gangs, even though the charity for which he works still has to carefully smuggle him through enemy lines  five years after he left his gang. He is also wanted by the Glasgow police, but in a good way. They regularly ask Palmer to talk with new officers about how to get through to gang members. The role reversal amuses him. "We used to phone them up just to toy with them so we could get a chase off them," he says of the police. "Now they're phoning me up for advice." As London and other cities in England erupted with rioting for several days in August, Glasgow, once a crucible of gang violence, remained remarkably peaceful. If the riots had happened even five years ago, there's a good chance that gangs in the city and in the surrounding Strathclyde region would have been stealing headlines from their southern counterparts. Instead, as Britain's politicians and police chiefs analyze what went so terribly wrong in the capital, they're asking, Can Glasgow's lessons be applied to London? Prime Minister David Cameron thinks they can. "I want us to use the record of success against gangs ... [by] the Strathclyde police in Scotland, who have done this by engaging the police, the voluntary sector and local government," he told a special session of Parliament in the wake of the riots. "I want this to be a national priority." Glasgow suffers from the greatest economic disparity in Western Europe. It also has a hard-earned reputation for violence and criminality. But it wasn't until 2004, when a U.N. study showed that Glasgow had the highest murder rate in Western Europe, that the local police confronted reality. "It was like in AA, where we admitted that we had a problem, and that was the hardest part," says Karyn McCluskey, who started the Strathclyde police department's violence-reduction unit, or VRU, in 2005. McCluskey and her colleagues c0-ordinated the efforts of existing charities, the courts and the police to create a more holistic approach to treating youths. The beefed-up effort, funded by the city council and the Scottish parliament, funneled money into programs starting in the cradle and focused on a combination of self-esteem boosting and zero-tolerance tough love. The programs have had astonishing results. Violent crime has plummeted 49.2% in the past two years. Glasgow continues to have a high murder rate: 3 per 100,000 people in 2009, down from a peak of 6 per 100,000 in 2004. (Though still the fifth highest in Western Europe, it is nonetheless much lower than that of comparable U.S. cities because of the rarity of gun violence.) 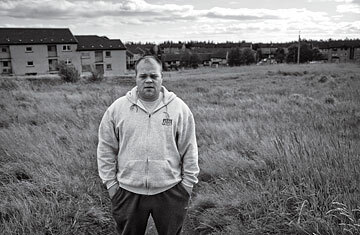 And gangs continue to plague neighborhoods like Palmer's old stomping ground, Easterhouse. But the city on the River Clyde can justly claim to have turned the tide. Even so, English police chiefs believe they can learn from their Glaswegian counterparts, who in turn borrowed policing tactics that worked in U.S. cities such as Boston and New York. The biggest takeaway: never stop communicating. The VRU has pressed police and community workers to open  and maintain  lines of communication with youngsters, especially those who are already in trouble. Jail cells have become venues for group-counseling sessions; court hearings have become opportunities for family bonding.